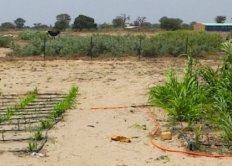 A newly published study shows that those same shrubs — when planted adjacent to millet — can share the precious water they draw in and boost production of one of the primary grains that provide nutrition to West Africans. The new study has found that certain woody shrubs — notably one called Guiera, after the Latin name Guiera senegalensis — can effectively share their water with millet plants below the surface of the soil. Millet, a grain crop, along with sorghum, is an essential food source in Senegal.